Wilson Pro Staff 97 and Wilson Blade 98 are both heavy tennis racquets. If you are a big hitter who prefers a heavy, powerful model, these are great options. Wilson Pro Staff 97 excels in serves and groundstrokes, although one needs some real strength to wield it properly and efficiently. On the other hand, Wilson Blade 98 is actually a little bit lighter, but most of the weight is placed at the head in order to deliver more power. See more details on Wilson Pro Staff vs Blade below. Wilson Pro Staff 97 is just as long as Wilson Blade 98 at 27 inches, but the head is not as wide. The head size is 97 square inches, featuring a string pattern of 16 mains and 19 crosses. This racquet is slightly heavier at 11.7 oz. Some people go as far as describing it to feel like a mallet due to the considerable weight. Unless your arm is really strong, it swings quite slowly through the air. By the way, you may be interested in our previous post about Babolat Aero Pro Drive vs Wilson Pro Staff 97, so don’t forget to take a look. Wilson Blade 98 has a wider head which is 98 square inches. The string pattern has 18 mains and 20 crosses. It is slightly lighter at 11.3 oz, but the swing weight is actually higher because some of its weight is placed at the head. If you feel comfortable with the weight, Wilson Pro Staff 97 can give you a very good blend of power, spin, and maneuverability. Hitting with this racquet from the baseline is very comfortable. You will feel really connected to the ball on the hit because it allows the ball to sink well into the stringbed. It can also generate lots of spin when you want to take a bigger cut. However, controlling the depth can be a little bit tricky, as it tends to deliver high-powered hits. On the other hand, Wilson Blade 98 is somewhat the contrary. It can also deliver strong power and great spin, and it is also highly stable. It provides good control to the user. However, the stringbed seems to damp the hit more. The feel is more muted, which is why some players don’t feel comfortable with it. 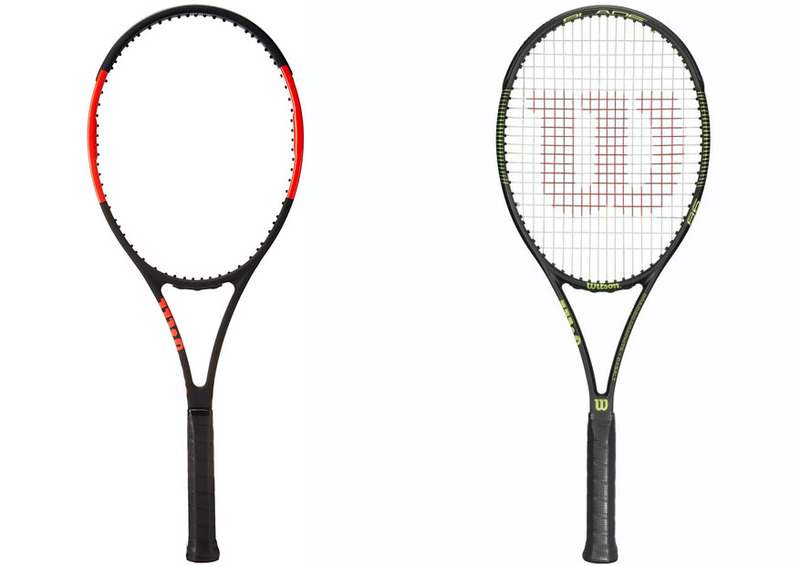 Between Wilson Pro Staff vs Blade, which one does have the best performance on serves? Both racquets have decent power and spin potential, but Wilson Pro Staff 97 is generally more preferred. This is because Wilson Pro Staff 97 is able to provide easy access to its power and spin. On the other hand, Wilson Blade 98’s dense stringbed somehow reduces the flex and spin. Both are equally great for returns. Some people think that their heaviness may reduce their maneuverability, but this is not an issue for most big hitters. In general, Wilson Pro Staff 97 is more recommended because it has great power, spin, and feel. It allows you to feel really connected to the ball on each hit. It is also better on serves as it allows easier access to power and spin. On the other hand, Wilson Blade 98 tends to be easier to control, but the feel isn’t as great.